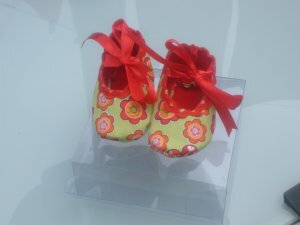 I make these shoes to order, they come in all colours ideal for boys or girls. Sizes 0/3 3/6 mths. They come in a clear presentation box, ideal for christenings or baby shower presents. If other sizes are required i would need measurements. I also make quilts for cots. Please remember there is p&p to add on. Any questions feel free to contact me.